The Terence Hill-Bud Spencer-Sergio Corbucci combo takes the jump from spoofing spaghetti westerns to buddy cop flicks. A robber involved in an $20 million heist is released eight years later and almost instantly winds up dead in Miami. This draws the interest of an FBI agent from NY, his friend who is not longer involved in law enforcement and their former chief who originally brought him to justice. They never learned the identities of his other two accomplices or recovered the stolen money, but the recent murder brings them together again undercover as members of Miami's finest to permanently resolve the case. 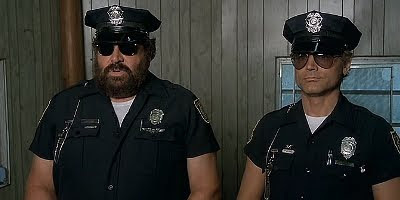 From the Miami Vice-like opening title sequence to the soundtrack's synthesizer music, Supercops just screams the typical 80s police action-comedy format. Even the main score seems to be Corbucci's answer to the Axel F theme from Beverly Hills Cop. Some gags are funny, but others miss the mark in a tempo that's slow for this type of cop flick. Even the fistfights and shootouts with Hill and Spencer lack a certain energy the audience is used to seeing from the duo. It could be due to their ages, although Hill looks "Soopa-Soopa" in his Miami policeman's uniform ala Poliziotto Superpiu. Far from the combo's best effort, it is still worthwhile for fans to seek out. While it's always good to see Hill and Spencer on-screen together, this film will have you reaching for an old Trinity title as soon as the credits roll.